Eritrea does not fabricate, lie, pretend etc. to advance its political interests at home or abroad. Eritrea does not harbor any ill will against the United States or the American people and only seeks justice and respect for the rights of her people. Eritrea does not make accusations it cannot back up with facts and evidence-and seeks the same when being accused. So when Eritrea puts the responsibility for the “stalemate” in the Eritrea Ethiopia border issue squarely at Washington’s feet-it is not because it imagined it to be, but because the facts actually do show that it is the US (with its allies in tow) that has single handedly undermined the Algiers Agreements it witnessed and guaranteed, attempted to amend, revise, re-visit the Eritrea Ethiopia Boundary Commissions’ (EEBC) final and binding delimitation and demarcation decisions of 13 April 2002 and November 2007 respectively, and provided the minority regime in Ethiopia the diplomatic, economic, political, and military shield and support as it continues to occupy sovereign Eritrean territories, including Badme, the casus belli of the Eritrea Ethiopia border conflict of 1998-2000. 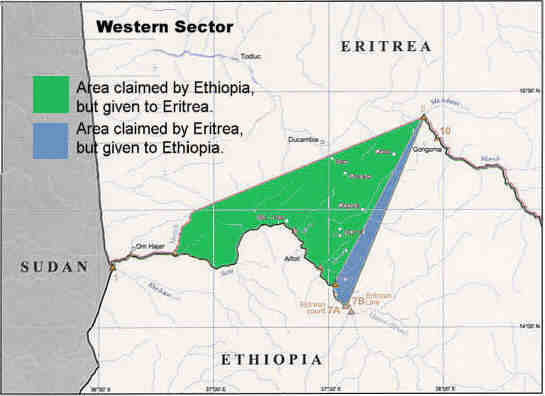 The orchestrated vilification and defamation campaigns by the EQL and their handlers intensified when the EEBC, which had the sole mandate to delimit and demarcate the Eritrea Ethiopia border refused to allow the various gimmicks and ploys presented by Ethiopia and its handlers in order to amend, revise, re-visit and annul the EEBC’s final and binding decisions. After publicly claiming to have “won” in court and accepting the Eritrea Ethiopia Border Commission’s decision as final and binding and urging the international community to pressure Eritrea for the speedy demarcation of the border, Ethiopia defiantly held the demarcation activities hostage by demanding changes, amendments, and revisions, with acquiescence and tacit approval of the United States and its allies. Ethiopia which depends on the US and its allies to feed tis people, manage its economic, social and military sectors and subsidize 60% of its budget has been emboldened by the shield and support it receives. Suffice it to highlight excerpts from the following US Embassy cables that clearly show the extent of US interference and influence in appeasing the minority regime in Ethiopia as it violated international law, the EEBC’s final and binding decisions and the over two dozen UN Security Council resolutions that called on it to abide by its moral and legal treaty obligations. Meles Zenawi told Vicki Huddleston, US Charge D’Affairs and CJTF-HOA Commander Rear Admiral Rick Hunt on 13 June 2006 that Ethiopia would attend the June 15 EEBC meeting in the Hague, but believed the “process was a dead end” and would soon break down because Eritrean Isaias had not yet committed to peace. OBJECTIVES: USUN should seek to: (1) extend UNMEE’s mandate for six months; (2) continue the Temporary Security Zone (TSZ); (3) avoid discussion of the Ethiopia-Eritrea Boundary Commission’s demarcation decision by map coordinates and any pressure for the parties to implement it; (4) support the SYG’s efforts to engage the parties; and (5) support efforts to lift restrictions on UNMEE, especially the current fuel crisis. 12 December 2013 will mark the 13th Anniversary since the signing of the Algiers Agreements between Eritrea and Ethiopia. The UN Security Council ought to shoulder its moral and legal obligations and call on the regime in Ethiopia to vacate from sovereign Eritrean territories and restore Eritrea’s sovereignty. This entry was posted in Uncategorized and tagged Eritrea, Ethiopia. Bookmark the permalink.